A traditional and unique dining experience. When at Hill Tribes’ do as the North Thai people do. Experience a real North Thai Khan Tok dinner. Take off your shoes, sit on the bamboo mat, lean against the comfortable triangle cushions and enjoy your unique dining experience. 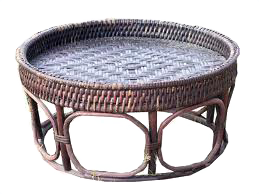 The name "Khan Tok" in the northern dialect means a low, round table that holds the food dishes for the khan tok dinner. 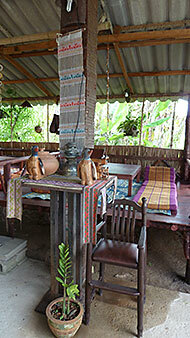 At Khan tok dinner guests are seated on the floor, with plenty of triangular cushions for support. These dishes are garnished with sliced cucumber, long beans, baby egg plants & fresh basil along with other fresh garnishes. To get the very best from the Khan Tok dinner, you should use your fingers to pull clumps of sticky rice from the basket and then scoop out small morsels from each of the dishes. If you don’t like eating with your fingers, there are always spoons & forks available! However, if you prefer having your meal at the table – Khan Tok is also a perfect place to sit and enjoy your dessert or drink after the meal. Or just relax with your friends with fingerfood and drinks. We are looking forward to taking your reservation for a Khan Tok dinner at the Hill Tribe Restaurant.